When you work in a people-focused environment it becomes essential to know where you land on the introvert-extrovert scale. Not because one is better than the other but because the underlying physiology associated with these traits can help you both understand your behavior + take effective action. Spending a lot of time in large groups of people is going to look and feel different depending on where you are on the I/E scale. This is so much more than a label. This is your brain chemistry manifesting in your behavior. Each have their strengths. What’s more important is that you use who you are to your advantage. As a mom, coming to a new level of understanding about how my brain works has been fundamental in helping me overcome anger issues + apathy toward problems that arise. It has helped me get in rhythm with my body so that I can effectively take action and recharge. It has also made it a lot easier to break up with some numbing tactics because I know what will actually help me recover. Remember when I talked about self-care being whatever you have to do in order to keep going? This is one of those things. If you’re not convinced yet that this is something you need to know about yourself, then ask yourself if you wish you were happier, more consistent, or had more willpower. What I’m about to talk about will get you on that path too. 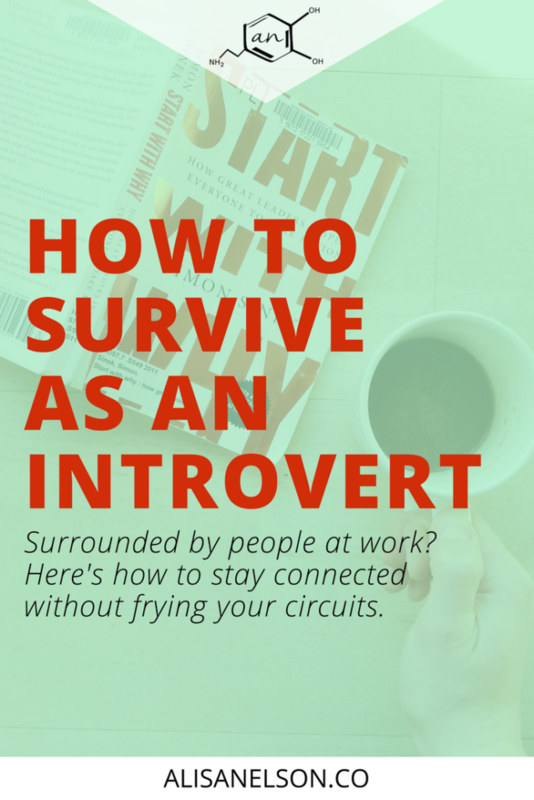 This week we’re hitting on how to help introverts stay engaged + connected in a people-filled environment. In a few weeks we will circle back and talk about the extrovert side of the spectrum because everyone has obstacles to staying engaged and understanding the brain’s role can help us take effective action. If you’re more extroverted, send this to all your introverted friends and stick around because we’ll get to you. I promise. Ok, I have A LOT to talk about today. So enough intro – let’s dive in. I’ve taken a myers-briggs test probably at least half a dozen times. And every time I come out being called an extrovert. And it’s just not true ya’ll. Perhaps you’ve heard of the word “ambivert” where you’re a nice little half-blood but let’s get more descriptive than that. If you find yourself easily fatigued by large crowds or needy children but you also would occasionally choose to meet a close group of friends at a loud restaurant without a second thought than you are probably an extroverted introvert. Meaning you are on the introvert side of the spectrum but can also a bit extroverted in limited capacities. If you’ve regularly felt in-conflict with what these tests tell you about yourself here’s a little disclaimer: you probably are answering based on who you think you should be. Often it is so ingrained that our automatic response can even be misaligned with our actual physiology. And with that beautiful word, let’s start talking about the major chemical difference between an introvert and an extrovert. The biggest difference is a pretty simple one, really. An introvert has a greater sensitivity to dopamine. Dopamine is released in the brain under a variety of circumstances, one of them being new environments. It plays a role in learning + memory. Therefore when you encounter new stimuli to be sorted and interpreted, dopamine floods the brain. Introverts require very little stimulation for dopamine to be released and to reach saturation. In contrast, extroverts require greater stimulation for dopamine to reach saturation. In other words: an introvert requires less input to reach the desired happy, creative, and thoughtful state. Knowing this we can identify the real reason introverts struggle to engage in a large crowd. Shyness is not the answer – overstimulation is. From a quiet corner a person can help their brain sort through the new information a little bit at a time and determine the best mode of entry into the fray. A new place with new faces, smells, sounds, etc. is often too much for an introvert to sort through on the spot – especially since that environment is also going to bring on a slew of internal reactions like self-talk, anxiety, increased heart rate, etc. We use these internal processes – like releasing dopamine in a new environment – to get a lay of the land mentally. We modify our mental models, identify key players in the room, strategize our approach, integrate and transfer ideas, and develop appropriate responses as we integrate our feelings with all the other information. However, all of the input make it difficult for an introvert to truly listen and thoughtfully respond to the people. Instead they will depend upon previously established mental models for interpreting what’s happening – requiring them to stick to preconceived scripts and ideas. Maybe you can cope well enough in a social environment. Keeping conversation light + playful can be nice. But when it comes to a work environment, you need to be able to function at a higher level, right? Not just to meet expectations but for your personal satisfaction! Overstimulation impedes a person’s abilities to regulate their behavior (getting out of reaction mode), make decisions, focus on the task at hand, determine prioritization, communicate effectively, find + implement creative solutions, etc. Basically, anything that requires you to take in the immediate environment and rapidly turn out an effective response. When I was a new mom I heard all the time how important it was to have a routine for the child’s sake. I love child development and they are right on – for kids, everything is new. And that means they are prone to overstimulation. Just like me. Their capacities are lower than an introverted adult – I can eat a cookie before bed and not go berserk – but they need an environment that takes their developing brains into consideration. Similarly you need to set yourself up for success, taking YOUR brain into consideration. On any given day there is so much that is outside of our control, but this? This is on you. We have a phrase in our house, “make it easy.” And that’s what you have to do here. Easy doesn’t mean it’ll come naturally or feel effortless. It means that you will apply force in the necessary areas to see productive results. So shall we dive in to where you should apply that force? YAY! BUT FIRST: we’re already at 1000 words here so if you need to take a break and digest how this new information on introversion affects your life, please do it now. Bookmark or pin this post and come back when you’re ready to implement. Let this be your first action step → don’t force yourself to take in more than your brain can handle. We don’t want this to be yet another thing that just sits in your brain because it was too much too fast. If I sound like a broken record I promise it’s not just because I’m merely fixated on self-awareness. It really is the first step to changing any behavior. Self-awareness involves two areas: Where you are and where you want to go. You don’t know if you have enough gas in your car until you check. And you don’t know if it’s enough unless you know how far you need to go. Ya with me? What does it look like for you to be overwhelmed / overstimulated? Do you get snippy? Anxious? Start puttering around without getting anything done? Go into autopilot? Feel like you need to crawl out of your skin? Just me? What kinds of situations push you over the edge? Is it correlated to a time of day? What, if any, actions seem to help you stay below that threshold? How do you typically respond to overstimulation? Are you reaching for your phone more? Thinking about what you’ll watch on Netflix tonight? Daydreaming? What signs seem to act as a warning bell that the threshold is approaching? Is it inappropriate to lock my kids outside and start making dinner at 3pm? I used to tell myself that I couldn’t be a planner. As soon as I would set a schedule or routine for myself or for my kids, I would feel stifled and never do it. You know what came with that? No energy to talk to my husband. And very few “fun-mom” moments. This isn’t a judgment on me – or anyone else, obviously we don’t judge here – but aligning with my strengths requires that I limit the space left for spontaneity. Like if I’m “spontaneously” deciding on what we’re doing for the day as it unfolds, I’m instantly decreasing my ability to roll with whatever antics my kids think up. My physiology struggles to have both. Nothing stifles fun mom faster than realizing I don’t know what’s for dinner at 5pm. BUT you know what I can do? I can take 5-10 minutes the night before (and a little longer on Sunday) to map out our day. It is pretty literally the worst to get to dinner time and have no energy to do anything but throw children in bed and zone out on the computer. In days gone by I would very passive aggressively make it obvious to my husband that I was not interested in talking to him and heaven forbid he attempt any physical contact. My fried brain was is fight mode and it wasn’t going anywhere. If you want to be able to stay engaged throughout your work + have energy leftover to really connect with the important people in your life, you have to be more selective in your spontaneity. Own that brain chemistry, girl. Here’s where your mental image for who you want to be comes into play: do you want to be a person who has to zone out every night? Or do you want to be able to meet friends for a drink or take your kids on a spontaneous picnic? If it’s the latter, than you need to put in the effort to streamline your daily decisions. Consider what you wish you had more energy for – Playing with your kids? Weekly dinner with friends? Space to devote to a hobby you’ve let fall aside? Time with your husband that is beyond netflix + ice cream? Now think about your day – where does it feel like you’re expending more energy than should be necessary? What feels especially draining? What could you do to make that area / event more predictable? Here’s another good place to stop. Take action on these first two steps before adding more to your plate, k? We’ll wait. There is SO MUCH MORE science to tell you about, guys. But I’ll refrain and save it for another post. The big idea here is that you are an organism. Not a machine. Your body functions in a rhythm, requiring input + output for a wholehearted life. You, my dear friend, are one of those amazing people who literally can’t help helping. It’s just a part of your life. It makes you who you are. But that does not mean you are an exception to the rule: your body, mind, and spirit need nourishment if you want to keep on doing this thing called life. Sleep is one way our bodies take a time out to refresh. Your brain and the rest of your tissues are working all through the night to repair cells, get rid of toxins, refresh its stores, etc. So sleep is hugely important. And more than that – our brains need a chill-out time throughout the day too. Ok maybe I told you a little more science. As introverted folk, we need to honor that during-the-day rhythm. Remember up above when I asked you some questions to build your self-awareness? Well, here’s where that info is useful! There are going to be times during the day when we feel a lull happening. The lull is your brain saying, “Cool it! Let me catch up, por favor!” We’re taking in information all the time and giving your brain a few minutes (with 15-20 being optimal) to play catch up, you will be able to better maintain energy levels throughout the day. Which mean you’ll be better able to stay engaged with the people around you instead of just wishing everyone would shut up. Social media scrolling is NOT allowed during these mental breaks. I was gonna be all “not the best choice” but this is too true and too important to play PC. Don’t do that to yourself. It’s fun, obviously. But pick a time during the day when you are going to intentionally engage in that and don’t let it be your “I’m tired so let me just scroll” as if that’s productive or helping you unwind. Trust me, it’s not. Think about your usual day, find a moment around midmorning and midafternoon where you can take a 10-20 minute breather. Even if you can only start with 3 minutes, do it. Set your phone alarm to remind you. Follow through and take a few minutes to let your mind release. Take some deep breaths but don’t try to focus on anything (or nothing). No effort here. Do this for a week – make notes about any differences you experience. Your brain wants to run on habits. It is more energy efficient. Daily rituals allow your brain to chunk certain activities and tie them to cues + rewards – making it easier to build the habit AND incorporating natural motivation because rewards involve happy chemical release (which your brain like really, really loves). Again, this section can (and probably will) be its own separate post and as we near the 3,000 word mark let’s keep the action here simple + tied in to the above action steps. You need a nightly routine for mapping out the next day + closing down this one. What do you get out of a nighttime routine? Your brain gets cued up that sleep is coming. That alters your brain chemistry, making it easier to fall asleep. Making your plan for the next day gives you the chance to reflect on the day, realign with your priorities, and head into the next day giving your focus to people instead of to tasks. And finally, you get the opportunity to purposely close out the day. Rather than suddenly realizing it’s 10pm and you haven’t set the coffee pot, cleaned up dinner, or read that book you’d intended to start, you can rhythmically move through your evening into the things that fill you up for another day. Imagine it: going to bed full instead of feeling guilty, rushed, or scattered. You guys, I’ve tasted and seen. It is so, so good to end the day feeling grateful + connected to what is most important to you. What’s your current night routine like? What do you like about it? What do you wish you were doing differently? Start with the time you want to be in bed and work backwards, how will you spend your evening? What time do you need to close your computer or turn off the tv? Give yourself 5-10 minutes to plot out your next day as you close down the kitchen or before you watch a show. Pick 1 or 2 (short) things that you can do just before getting into bed that will help you transition your mind from activity to rest + align you with what is most important to you. Might be listening to music or a Bible app while you wash your face + get into pajamas. Maybe it’s journaling or writing a letter to a friend. Whatever it is, turn the lights low, be present, be grateful, and ease yourself into sleep. Download Insight Timer (free) for sleep meditations if you have trouble falling asleep. I have a couple of favorites (Yoga Nidras) that I have yet to hear the end of, even when it still feels like my mind is buzzing as I get into bed. I also like to set the sleep timer on Pandora to soft instrumentals (ok so really they are epic soundtracks). Introverts have a lower tolerance for stimulation. Stimulation is any + all incoming information to the brain from sensory experience to internal dialogue to feelings to verbal + non-verbal cues from people. In an overstimulated state you will struggle to make decisions, come up with creative solutions, regulate your behavior / emotions, maintain focus on the important stuff, perform necessary tasks effectively, etc. All of these inhibit your ability to engage + connect with the people around you in the present moment. Taking action to limit stimuli, discharge excess stimulation, streamline processes, and introduce systems + routines will increase your capacity for the people in your lives and keep you connected to your mission in the midst of all the noise. If this sounds like something you need + want to do but you feel overwhelmed at the thought of doing it by yourself, this is what I do with clients. In the very near future I will be unveiling a “work with me” page for beta testers of my coaching program. CLICK HERE NOW to get on the waiting list for beta testers to my coaching program.